PERHAPS YOU REMEMBER a compact disc which was released in 1982 and entitled A Feather on the Breath of God – Hymns and Sequences by Abbess Hildegard of Bingen? It was performed by an English group called Gothic Voices, starring Emma Kirkby, and is still said to be one of the best-selling discs of pre-classical music ever made. It certainly inspired a craze for the life and works of Hildegard (1098-1179), which is still with us. Gothic Voices was founded in 1981 by Christopher Page, who did all the necessary research for the group’s performances, directed them on the recording, and for some years continued to appear with them as a lutenist. Slowly he retired from the concert platform in order, amongst other things, to write this book. Gothic Voices continues to this day without him. A whole disc of chant by Hildegard of Bingen may sound like a rather esoteric treat: the music, one would be forgiven for thinking, dates from before the dawn of musical history and presupposes considerable specialist knowledge on the part of Page. Yet it puts the achievement of Page’s remarkable book into perspective, because just about every note under consideration in these six hundred pages was written before Hildegard was born. And so extremely esoteric is the subject matter in academic terms that it is no exaggeration to say the author has founded a new department of research. Esoteric it is, but not dull. At least not the way Page tells the long and complicated story of what people sang for nearly a thousand years before the invention of musical notation. Starting with the very early church (“there is no evidence for a distinctively Christian musical idiom in the first three centuries of the churches’ existence: Jewish, Christian and polytheist currents were constantly intermingling”), building through the dark ages of the collapse of Roman imperial power while the Roman church struggled to establish itself, and climaxing in the period 900 – 1100, when a whole new body of chant was composed and finally written down, thanks to a revolutionary new method, the elegance and clarity of Page’s writing keeps us wanting more. Churlishly perhaps, I wanted more at the end, since “the first thousand years” means we cannot go as far as even the very simplest two-part polyphonic writing, or the beginnings of the courtly song, both of which would have flowed so smoothly from the basic story of the chant. But no, every piece of music under consideration here is monophonic—a single line of unaccompanied melody. Since none of this music was written down until about 1025, Page is obliged to spend much of his time talking about the people who sang it, rather than about the music itself. He also has to sketch in a thousand years of historical background, which he does so deftly that he surely deserves the title of historian as well as linguist and academic musician. Early on he writes that “this book is principally based upon literary sources such as chronicles, lives of saints, letters and charters, with a particular emphasis (where possible) upon the curiously neglected evidence of epigraphy.” Well, it is neglected, at least by scholars of music, because few if any before Page had the linguistic ability to decipher all the new Romance languages in their various stages of development from imperial Latin in this long period, while also being able to write with authority about how the Gregorian modes work in strictly musical terms. At one moment Page can remark that “one would never know from thousands of pages of notated Latin in the plainchant manuscripts of 900–1100 that syncope of short medial vowels had ever occurred in Latin speech to produce a form like Old Occitan dons (DOMINUS)”; and at another, when writing about Letald of St-Mesmin-de-Micy’s attack on chants which mix their modes (Letald calls them “snake-tressed monstrous phantoms”), that “he was probably thinking of chants such as the antiphon Urbs fortitudinis, mentioned in several treatises of c.900 onwards for its hybrid modal character established by the single bnatural at por-TAS, shifting the melody from a transposed mode 1 to mode 8.” To add detailed and original historical writing to this kind of expertise is a rare ability indeed. Page’s crescendo to the invention of notation is at the heart of the book. Never has there been a more revolutionary moment in the history of “classical” music. It was the work of a man known today as Guido of Arezzo in the early eleventh century; and so effective was his creation that we still use it unchanged today. We take staff notation for granted now, but in its time it transformed the lives of everyone concerned with music-making in the religious houses, since they no longer had to memorize the whole corpus of chant needed for the church’s year—a fabulous amount of material by the year 1000. So long did the old process of memorization take (“from earliest youth until the hoariness of old age,” in the words of Bishop Agobard of Lyon) that it was blamed for lowering the standards of the communal life lived by these monks: instead of tending the garden of their souls, they spent countless hours in mechanical learning by heart. Nor were they necessarily thanked for their efforts. Guido himself thought singers to be “the most foolish of men” because their greatest labors were likely to produce the smallest results. So it was that Guido’s stave—a kind of graph, derived, perhaps, from the counting board or abacus—not only meant that a lifetime’s work could be condensed into two years study, it was also deliberately intended by Guido to help clean up the contemporary church, especially from the besetting sin of simony. His musical program was also a spiritual program: singing wrong notes in the chant was held to be as perilous for the immortal soul as any other carelessness in daily worship, and Guido’s reform so impressed his contemporaries that Pope John XIX called him to Rome to show him in person what his system could mean. With the Pope’s blessing, Guido’s method was then used to standardize what was actually sung throughout Western Christendom, since the approved chants were now available in portable manuscript form. Page gives some touching examples of monasteries beset by young reformers, whose task it was to tell eighty-year-olds that everything they had learnt by heart all their lives was not only wrong but carried the implication that they were defiled by their error. Rudolf of Sint Truiden was one such, joining his abbey at the age of eighteen in about 1098, burning with such reforming zeal that he rewrote all the Mass chants, even having to prepare the parchment himself from its raw state and then doing all the copying. Largely as a result of Guido’s invention, the Latin West had become a place of common worship by the twelfth century, and was given a name: Latinitas. By 1200, clerics envisaged the way they lived and worshipped as being of one tradition with one chant, despite the individual histories of sees such as Milan, with its Ambrosian rites, and the Mozarabic chant in Spain. The Cistercian order was founded by Bernard of Clairvaux to perpetuate the unity of the Roman way of doing things, and staff-notation was from the beginning crucial to their work. During the twelfth century they carried this notation to all corners of the Latin West, deliberately founding houses in remote places. Page concludes with the telling observation that so important was the unifying project to the church in the twelfth century that the great Frankish king Charlemagne, whose name was often invoked as the founder of a united Christian world, was even given credit for the use of staff notation. This was anachronistic by more than two centuries—he died in 814; and it was also ironic, in that Charlemagne had originally looked to Rome’s standing for help in the same project, where Rome was now looking to him. 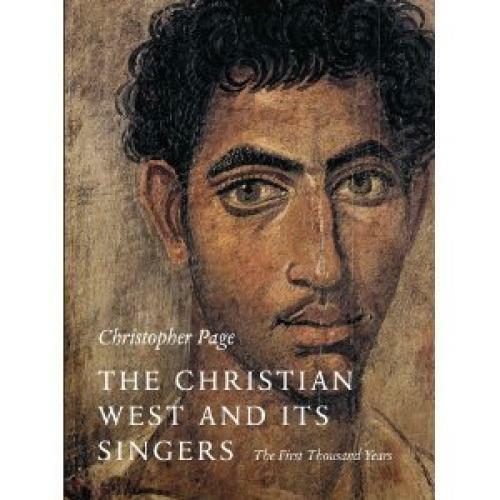 A thousand years of singers, some more spectral than others, begs a lot of background detail. The task of what to include must have been ticklish, but I am not sure Page always gets it right. Several of the chapters begin with quite elaborate scene-setting—engaging in themselves, but sometimes of questionable relevance. I thrilled to the diagram illustrating the most intensive zones of olive cultivation in the late Empire—and indeed that of Mediterranean shipwrecks between 2500 BC and 1500 BCE—but later I wondered whether, if Page thought it necessary to go into such detail about Pope Innocent’s correspondence, he might have spent a little longer on the overall picture, and especially on the Byzantines. It was with a jolt that I learned, after several chapters on Rome’s position in the Christian world, that in fact “the papal city had lain in the Byzantine duchy of Rome since the wars of the Emperor Justinian.” And that’s that. The index carries no reference to Byzantium, one to the Orthodox church, and only three in the main text to Constantinople. I was similarly jolted, after reading for some time about Francia and the Franks, to discover that by the late ninth century there were in fact two kingdoms, West and East, which were briefly reunited under Charles the Fat in 884, only to separate again in 887. Throughout Page’s account we read about Francia as if it were one polity. If the scope of Page’s narrative is original, there are also several more local arguments that he signposts as being his own. He writes, for example, “The heart of the issue here is that ‘the political unity of Gaul’ cannot have been the motive impelling either Pippin or Charlemagne to charge the singers of certain churches to follow Roman usage. This is the major mistake that a great many commentators on these matters have made. Pippin would never have supposed that it lay within his power to impose a uniformity of rite in his kingdom ... he would have been poorly informed to suppose that a design to impose the Roman rite could succeed against the grain of so many local interests, or in spite of the practical difficulties it would encounter.” In short, it would take tact and time. Having sounded this necessary note of caution, Page then goes on to pay tribute to Pippin’s queen, Bertrada, who is almost entirely forgotten, but whose influence was powerful both through her being by Pippin’s side all his reign, and then living another fifteen years into Charlemagne’s; and also through her household, where her hall nurtured young men of ability. Most significantly there is the matter of Guido’s fifth treatise, the so-called Epistola Widonis, addressed to the Archbishop of Milan. Owing to “insensitivity to the ascetic temper of Guido’s life and work,” Page notes, modern scholarship has ignored it. He underlines Guido’s motives in devising his notation, which reaches “far beyond the demands of the choir school to his concerns about the state of the contemporary church.” Indeed, he goes further: “Something similar might be said of all the medieval writers who laboured in the vineyard of music theory; each one knew that the accord of well-trained singers gave unique expression to fraternal caritas and to the Church as the company of the faithful.” But Guido’s work was exceptional both in its depth and the intensity of its engagement with the developments that gave the church its consolidated medieval form. This passionate concern for musical standardization across the Christian world was part and parcel of the need among many young countries and provinces in a violent and rapidly changing world to have something permanent to hold on to. It was in Rome’s interests to provide that sense of permanency. Such a need was to last a very long time, at least as far as the reign of Mary Tudor in England in the 1550s, when she was trying to take her country back into the Roman communion. The story is told of her inspectors reaching a rural parish and discovering that the local people had for some decades been solemnly using the word ‘mumpsimus’ for the correct ‘sumpsimus’ in their worship. When the visitors tried to explain that this was not satisfactory, the priest became enraged, saying that his congregation were attached to ‘mumpsimus’ and that they would on no account change it for this new-fangled ‘sumpsimus’. They then drove the inspectors out of the parish with sticks. Page’s account contains many similar confrontations. Page is capable of turning some very neat and memorable phrases, which help him seem to wear his learning lightly. His description of what it was like for a singer to have to memorize so much chant can hardly be bettered: “a plainsong melody principally existed as a feeling in the throat, a sensation in the ear and a penumbra of associations created by years of repetition, by the lengthening and shortening of days or by the arrival and disappearance of seasonal fruits at the common table.” Or, even better: “The task of trying to form an impression of Christians and their singers in their first three centuries is like assessing the position of Muslims today using only the websites of Islamic extremists and official pronouncements about the War on Terror.” The range of Page’s expression is one of the many features of this extraordinary book. Peter Phillips is Director of the Tallis Scholars, and the publisher of The Musical Times, and Reed Rubin Director of Music at Merton College Oxford.